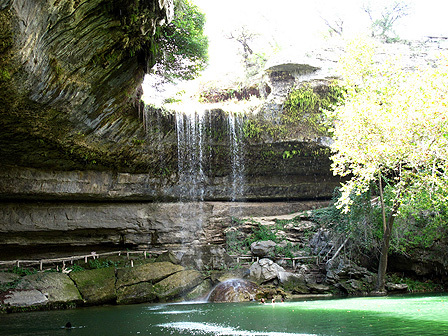 Hamilton Pool Preserve – SAVED! Hamilton Pool Preserve is a natural feature in southwest Travis County upstream from the confluence of Hamilton Creek and the Pedernales River. The pool occurs where Hamilton Creek spills out over limestone outcroppings, creating a 50-foot waterfall that plunges into the head of a steep box canyon. The waterfall never completely dries up though it slows to a trickle in dry times. Hamilton Pool Preserve is suffering from its own popularity as a recreational destination as well as from minimal regulation and increased suburban development. In May 2007, Hamilton Pool and Hamilton Creek suffered major silt and erosion runoff during the construction of a residential subdivision upstream. The damage to Hamilton Pool, Davis Creek, Cripple Creek, Hamilton Creek and 10 unnamed tributaries in the surrounding area has been devastating. Nominator: Hamilton Pool Road Scenic Corridor Coalition and the Hill Country Alliance.